Impressive contemporary located in a cul-de-sac! Grand foyer welcomes you to the massive GR with breathtaking two story fireplace and dramatic open staircase. Fantastic cook's pleasing KT has pristine HWF's, butler's pantry, snack bar, SS appliances, adjacent formal DR and an amazing sun-filled dinette. French doors greet you in the 1st floor den. 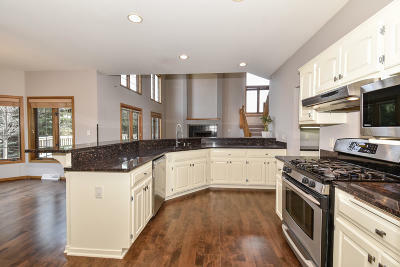 Spectacular Granite counters abound in the KT, rec room and all 4 baths. Ascent to the enormous MBR retreat which features dual sinks, ceramic tile, relaxing whirlpool tub and cozy gas fireplace. All BR's have cathedral ceilings and walk-in-closets. Convenient main level Laundry. Get away to entertain in the epic rec room with beverage bar, gaming area, TV/FR and additional full bath. Huge BBQ deck. Side entry garage. Fresh paint, HWF's & carpet.